Would Democratic Governor Kill Foxconn Deal? Democratic candidates for governor oppose deal. Could they kill it if elected? 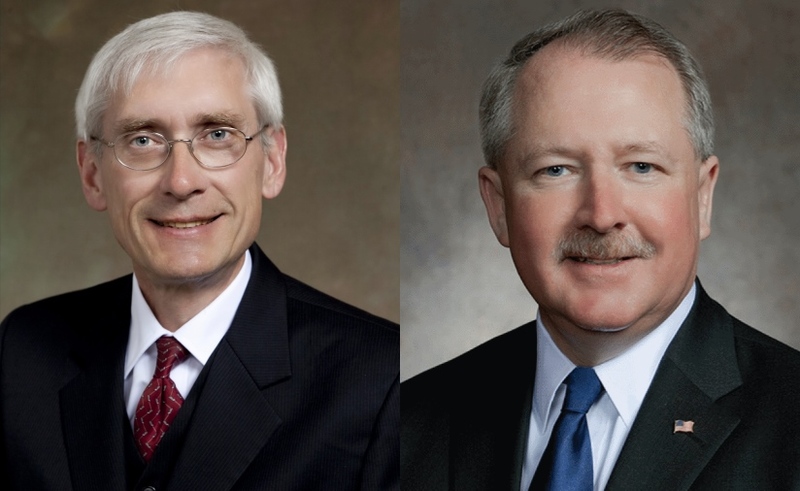 Tony Evers and Dana Wachs. A Wisconsin governor plans a major, costly economic development deal with the Legislature’s support. But a governor of the opposite party gets elected, killing the deal. This is not a hypothetical reference to the Foxconn deal, which would give that company $2.85 billion in tax breaks over the next 15 years if it invests $10 billion and employs 13,000 in Wisconsin. The Foxconn deal, championed by Republican Gov. Scott Walker and GOP legislators, and opposed by Democratic candidates for governor, has been approved by the state Assembly and will get a Senate vote next month. Walker is up for re-election next year. This scenario is similar to what happened back on Nov. 4, 2010, when Democratic Gov. Jim Doyle killed a proposed high-speed train between Madison and Milwaukee, although the federal government offered Wisconsin $810 million to pay to rebuild tracks and outfit the cars. Why did Doyle kill a train he and Democratic legislators wanted? Two days earlier, voters had elected as governor Republican Scott Walker – an opponent of the train – and a Republican majority in the Legislature. Fast forward seven years to this question for Democratic candidates for governor: if the Foxconn deal is law and the company has started construction in Racine or Kenosha counties, what would you do if elected? At a Wispolitics luncheon, Gronik said he is not aware of an “exit clause” in the proposed Foxconn deal, so he could be forced to honor it as governor. Gronik also noted that Foxconn is a Taiwan-based company, so any lawsuit over the contract or its terms may be litigated in a foreign country. That could make it hard to “battle through deal points with that company,” he added. Another Democratic candidate, Rep. Dana Wachs, of Eau Claire, is a lawyer who has not said what he would do to renegotiate or cancel any Foxconn deal, if he is elected governor. Milwaukee attorney Matt Flynn, who has also indicated he plans to run in the Democratic primary, has called for the deal to be renegotiated. Some Democrats opposed to the Foxconn deal have cited the company’s 2013 promise to invest $30 million, and hire 500, at a new Pennsylvania factory – a factory that was never built. In 2013, Republican Tom Corbett was governor of Pennsylvania. In 2014, Democrat Tom Wolf was elected governor. How much of a role – if any – did that change in political power play in Foxconn’s broken promise to Pennsylvania? Foxconn is a worldwide win for Wisconsin and Walker/Trump so naturally the Left wants to kill it even though it will be bonanza for Wis. There was a ton of states that wanted this. People/businesses will come up from Illinois,i fleeing the Nutty Left in Illinois, that the Left here wants to emulate. Last time in office they broke us. It will make SE Wisconsin the Midwest Tech center of the US. jobs fro everyone. No more welfare for lots. Flynn who was the hatchet man for Weakland , beating up the little kids assaulted by the Weakland homosexuals. What does the Left want to do? Spend 3 billion on more welfare, food stamps, Medicaid, and bigger salaries for education and govt. employees. Wisconsinites want jobs not more welfare.